A farrier told me about a new hoof care product line from Red Horse Products -- an all natural, antimicrobial/anti-fungal line that comes in various formulations/consistencies to work as a topical application, to fill small cracks, and to plug deeper crevices. 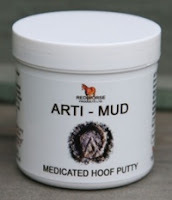 I thought it might be an alternative to Keratex hoof putty which can be rather difficult to work with, especially in cold weather. Right now Red Horse products are only available from the UK but you can order it if you don't mind the shipping fees. 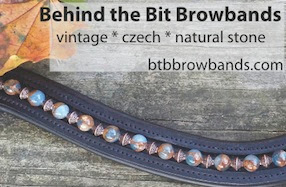 The product itself is reasonably priced, and the cost for both products plus shipping from the UK was $60. I'll be interested in how well this stuff does stick in the hoof. Sometimes Tucker gets a crack that my farrier cleans out to leave a gap in the hoof edge. It would be nice to have something to fill it in that would stay there during turnout. All the red horse products are fantastic, i use all 3, field paste, hoof stuff and arti mud, they do exactly what they say they do, my mare has terrible thrush and i tried everything, bought some field paste and withing 36 hours it was completely gone, i stock u now and would never be without them.